"Hello everyone, first I want to thank you all, you are one amazing and generous group of people. Sadly I'm quitting the team right now and the sound designer is gone too so basically there is no team now. Best regards." It's a real shame because In the Line of Fire represented - to me at least - a move away from the myriad 2D shooters and platformers that have come to the Dreamcast. It represented something of a turning point for crowd-funded games and maybe a glimmer that there was a bright future for Dreamcast indie development - even more so when you consider Militia was looking to release the engine to other developers. The level of detail in the enemy character models, and environment in the stage I got to sample was almost on a par with commercially-related software. However, the failure of something as impressive as In the Line of Fire to gain backing will no doubt make other potential developers question if the Dreamcast is a financially viable platform to put their games out on. Last year the impressive looking Xenocider from Retro Sumus also failed to hit its target, although that game was was resurrected through pre-orders. 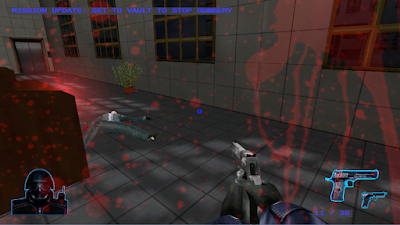 There are still plenty of games coming - at least at the time of writing - for the Dreamcast, but that In the Line of Fire was so criminally ignored could potentially have repercussions for future development on the system. Does this open up the potential of you guys releasing the image you have of the demo? As this project will probably never see the full light of day. Thanks Tom, even post mortem you have nice words about it. You know what, I'm glad the Kickstarter failed. If most of the team bailed because of it, or hell even if not, it raises questions of their dedication and ability to work together in general. If the Kickstarter had been successful, I think it only would've prolonged something like this from happening. It'd be an even bigger mess down the road, plus people would be out of money. -really? you think we swim in money? and we can afford to do this timeless? you lost nothing and think we did lost nothing too? we just picked up a demo from the street and post it on kickstarter! Totally agree with DCGX. To can the project so quickly after one failed crowd funding attempt shows a huge lack of commitment from this team. I am going to have to unfortunately agree. Quitting so damn fast is shocking. I don't get it. There are better ways to crowd fund these things. Kickstarter sets you up for failure when you only have like 30 days to pull in so many tens of thousands of dollars. That is unrealistic to expect everybody to know about it when many in the DC community who would fund something like this check in once every few months into the community and then go on about their lives. To jump ship and leave Phenom like that shows lack of dedication, and faith in his leadership. I just released a mod that was in development hell for 11 years, a Battlefield 2 total conversion mod called Battlefield: Korea. The odds were against us as well, but even though the group was small, we got it done. So trust me, I know a thing or 2 about developing a game. I understand the disappointment in having the kickstarter fail, but you just gave up so easily. I hate to think what would happen in other more trying circumstances. Would you just be an easy pushover or would you be a determined fighter ready to stand by the other team members through to the end? I am just as disappointed as the next person that the project has been shelved, but I also understand that it probably wasn't a decision that was taken lightly. As a community we should get behind these guys and encourage them to take it to another platform such as Indie Go Go or even try to fund the development through pre-orders, rather than attack them for cancelling it. That said, I also appreciate the frustration people have vented. I for one hope this isn't the end for In the Line of Fire, but pointing the finger and blaming people won't help that become a reality. Mr. Guerrero, this has nothing to do with money, and I think you glossed over why I said I'm glad the Kickstarter failed. It isn't because I didn't want it to succeed, far from it, and people on here, SEGAbits and Dreamcast Talk can vouch for how much of a fan I am of the Dreamcast and how much money I've spent backing projects. I'm glad the KS failed, because the quick bail by two of the devs communicates to the consumer a lack of commitment in the project which could've caused much bigger problems down the line had backers' funds been collected. I don't know what's going on with the game. I don't know you or the other devs. Maybe you're heart wasn't completely in it, or maybe it was and the failed KS broke your heart. But from the outside, the what looks to be giving up tends to extend from possibly already present issues. I almost allowed you to get under my skin, instead of throwing someone under the bus I'm going to take the fall and walk away. I'm so sad this won't happen. :( The game looked amazing and I would so have loved to play it on my Dreamcast. Dont know if you read my post at the kickstarter page , ill copy paste it here and hope you will read it if you didnt already , otherwise consider this again. Its a shame this did notget funded. What DCGX said earlier hit my mind as well , why give up on something you have started so good that actually can be a massive hit just becouse you fail the kickstarter ? Mr. Guerrero, I'm not trying to get under your skin. But the way you're reacting to my comments is very much the same way you've reacted to the failed Kickstarter. To up and quit after one setback is not the way to go, for anything really. But the fact that you did quit, along with the sound designer, sends a very negative signal to the people that did back your game and everyone else: that at the very least development of the game was distracted. My point is it's better to have this happen now rather than when you have a lot of people's money. We all know how Kickstarters go by now. Even successful ones. The successful ones will probably get delayed and some of those backers will get angry or concerned because they gave money. Unsuccessful campaigns pick themselves up and try a different approach (ex. Retro Sumus with Xenocider) because they believe in what they are doing. This would be a turning point for 'In the Line of Fire's' development. Either you have faith in your dev team and the game, and figure out a way to make it successful, or you do what you have seemingly done and throw in the towel because maybe this project wasn't for you to begin with. If I or anyone is giving money, I'd personally rather know now than later. @Florian Wallin I did read your last post at the campaign, I made my mind to not post any more comments there. Since the very 1rst day when I meet and talked with Ph3nom in private I told him I was looking to make a commercial project, that will require to make a demo to show to the public what we can do, the campaign was not supposed to be presented with "ideas", but you saw the campaign, several features had to be presented exactly as "ideas". @DCGX 9 months of work should be more than enough to have a demo ready but it wasn't, I really don't want to work at that pace any longer. For what is worth I allowed Ph3nom full permission to use all the assets I created, he can do whatever he wants, that was done via Email on Jan 15 and this flame war started about Jan 17 so the two things are not related at all. Ok, see, now we (the collective DC fan base) know. And this makes sense on why you bailed so quickly after the Kickstarter failed. My assumption of something not clicking internally was right. Which was my initial point. Clearly you weren't happy with the way development was going, and it's better not to have backer obligations. Basically, you're not trap in this production anymore. Mr. Guerrero, I really do wish you all the best. Maybe we'll see you on another DC production down the line, and hopefully under better dev team circumstances. Yeah, I don;t think anybody here wants to look at this in a negative light. We really don;t like to see projects fail in the DC community, as we are very tightly knit, and look at each other like family. I am saddened to see you leave the team, but I hope you can find happiness in something else yous do. I just hope you would consider staying. I think I can speak for most of us, when I say we were pretty blown away by the graphics of the game and the scope if it. Not often do we get 3D indie games, but here lately there seems to be a few here and there. I just want to say I hope there is no hard feelings, because at the end of the day you are still a human being and have emotion like anybody else. I am just saddened it happened like it has.